It's been a long time since we heard the first rumors that the next installment in the saga Star Wars: Battlefront happens at the hands of DICE, creators of Battlefield. Even long since this development was confirmed until we saw the first details of the game, but finally, a few weeks ago Electronic Arts released the first trailer and revealed the first details of Star Wars: Battlefront, which, according to its plan comes to coincide, roughly, with the release of the highly-anticipated movie: Star Wars: The Force Awakening. Star Wars: Battlefront is a game of shooting and action focused on the multiplayer game, it seems that seeks to balance the kind of shooter that more successful today, while trying not to stray too far from the conventions saga in which is based. Thus, the space battles in favor of the "earthly" far behind, with action items that will be more concentrated, with up to 40 simultaneous players into two teams of 20. 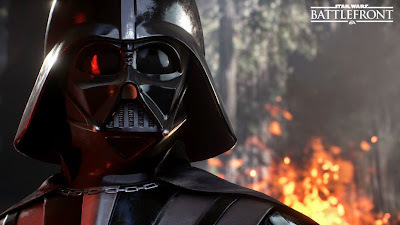 Yes, DICE has promised that Star Wars: Battlefront will not, by any means, modification or mod of Battlefield, and although it will share some similarities, just try to take what works in the genre and within the universe of Star Wars, respecting and giving identity to this new project, which will face the forces of the Rebel Alliance against the Empire. For example, in addition to fighting on foot, we have a lot of ships and vehicles of all kinds, through X-wings, TIE Fighters and even the Millennium Falcon. Recently it was also confirmed that we can also control AT-ST, the bipedal versions of ATAT, which function as a kind of tank. Another aspect that differ from most existing shooting games is that we can switch between the third and first person at any time, more freedom to adjust the camera when taking action. With respect to the camera, we know that most of the weapons will not help peephole with which to aim, although some, such as rifles, yes that will have a scope. Moving to the contents, DICE has also confirmed that the game will have a campaign mode. In return, we offer a series of "missions" that can be played both individually and with a friend, either local cooperative to split screen or online. For local co-op, there will be a system that will allow us to share experience and breakouts we get our friend and even reappear when we killed beside him. The split-screen mode is not available in PC, and is only available in offline co-op missions, where we fight against the artificial intelligence. Finally, it seems that no particularly distinct character classes, but many customization options, choosing equipment, weapons and abilities, and characters who look like they could have some characteristics. What's new Swedish study in the original trilogy of the series (ie, Episodes IV, V and VI), but also seems to be linked with Episode VII as visit one of the planets appear in the new film. At the moment we have four confirmed planets (Endor, Hoth and Tatooine Sullust), and there will be 12 different maps. With Star Wars: Battlefront scheduled for release on November 17 for PlayStation 4, Xbox One and PC -that say, a few weeks before the new movie, Star Wars: The Force Awakening, which will be released on 18 December-two weeks before the premiere of the film in theaters receive a free downloadable map Jakku set in the desert planet that we have seen in the trailers. Note that the game takes us to Jakku 30 years before the events of the film, so, in a way, it will serve as a prequel; we'll see to what extent. The characters that could have own skills that we mentioned previously are among the best known of the series, such as the iconic Darth Vader or Boba Fett no less popular. We still have no exact details, but these seem to be reserved for the most skilled players, and apparently are more powerful than ordinary soldiers, because in the right hands, these special characters may be crucial to lead their teams to victory. The trailer that accompanied the announcement of Star Wars: Battlefront. was nothing short of spectacular, and he could read everything seen was generated with the game engine Does this mean that the game will look like? Not necessarily. This means that DICE has the technology to make it look like that, but then have to adjust to the possibilities of each hardware, especially when Niklas Fegraeus, design director of this title, claims that operate at 60 frames per second on consoles. In any case, being an exclusive game for the new generation computers and can be expected to give us an appearance above that seen in other similar titles. The designs of the world of Star Wars and its dramatic soundtrack without forgetting its legendary sound-effects certainly manage to create memorable pictures. DICE is not skimping when it comes to achieving photorealism, and for this they are using "photogrammetry" a technique that captures elements - Company models, costumes, weapons ...- from virtually any angle through pictures and then getting set its polygonal versions virtually identical. This technology was used in The Vanishing of Ethan Carter, and the results were very good. There are still many questions to be resolved regarding Star Wars: Battlefront, but being supported by DICE believe that, at least, be an interesting and solid proposal within this legendary universe. We will not deny that is somewhat limited compared to other installments of the series, but had not yet seen the gameplay is very fast for review. In any case, we know that this title is a big bet for Electronic Arts, and the expectations are very high. If all goes well, they will not be many weeks until we know more about him.